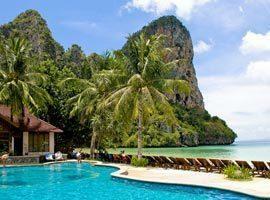 Krabi is an enchanting destination on the south-west coast of Thailand and a tourist magnet for many reasons. 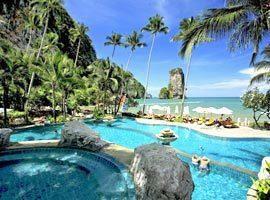 First and foremost are its beaches which are among the most spectacular in Thailand. It is also a treasure chest if you enjoy the outdoors with day trips to nearby islands and forests parks, it is the place for rock climbing and kayaking its shores is liberating. Our prices for a list of the best beach resorts in Krabi allow you to experience these idyllic charms while soaking in luxurious comfort for less. 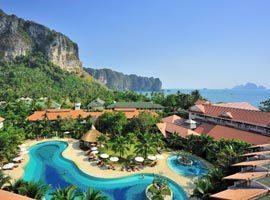 Aonang is where most tourist congregate and feature the largest concentration of hotels. As a result it developed into the busiest tourist area with ample shops, nightlife and restaurants. Centara's luxury villas is the only 5 star accommodation in Aonang and a great family resort, but the facilities offered at 4 star beachfront hotels like Deevana Plaza, Aonang Villas and Holiday Inn guarantee sumptuous comfort and convenience in the best location if you want to be near entertainment. 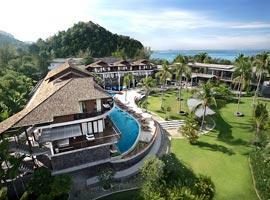 Railay Bay carries world class status. This ribbon of sand forms an immaculate sweeping curve featuring cave-like formations and views of gigantic limestone karts rising from the ocean which is as calm as a lake on a windless day. In the backdrop mountains are covered in lush jungle and it features an unrivaled destination in the region, namely Rayavadee's luxurious beachfront villas. Secluded areas like Nopparat Thara and Klong Muang are the best places to stay for a romantic honeymoon. 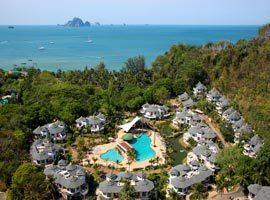 Aonang Cliff nestles amid unspoiled nature and with an elevated setting offers panoramic views across the bay. It offers an affiliated private beach and accommodation which include an ocean view room as well as a family room. Build around a central pool set in a tropical garden you will be surrounded by imposing lime stone giants cloaked in lush tropical foliage. 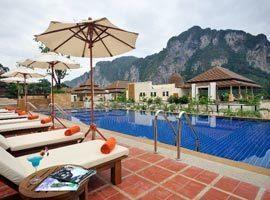 Located in Aonang you are steps from entertainment, restaurants and markets. A great place for couples the striking setting is in tranquil and secluded Klong Muang, approximately 10 minutes from Ao Nang. There is a seaside pool and all rooms feature private balconies which allow exceptional ocean views. This idyllic seaside hotel with a private beach is near Aonang and only accessible by boat to guarantee privacy complimented by views of exotic panoramas. Offers private pool villas with an outdoor flow and intimate ocean facing rooms. Holiday Inn is the best place for families near Aonang meaning a moment's walk from entertainment . It features water slides, a kids pool and kids club with separate teen zone. It offers family rooms, kids suites and pool access rooms. This charming hideaway is encircled by lush rain forest between the foot of a hill and an eye searing white ribbon of sand in Aonang to guarantee maximum privacy. It offers rooms with direct pool access as well as rooms with Jacuzzi pools. Phulay Bay is one of the top resorts in the region and recommended for couples who seek privacy and something extraordinarily romantic. 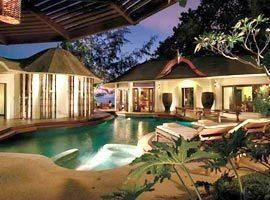 It offers exquisite villas featuring private jacuzzis to delectable sea view pool villas. Located directly on the beach in West Railay it allows enchanting views of an exotic seascape dotted by majestic limestone karts. It offers accommodation in privacy suites and deluxe cottages, plus you can also opt to have your own pool. 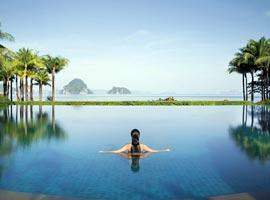 Rayavadee is a luxury resort with a design mimicking a southern Thai village. Located in Railay on the stunning Phranang Peninsula it offers uniquely designed spa pavilions and pool villas against a backdrop of sheer limestone cliffs.